Cloud storage has come a long way since, and I freely admit that cloud storage has made my life much better. Not only does it keep all files available to me regardless of which device I’m on, but it also works as a way to keep data backups 5 Basic Backup Facts Every Windows User Should Know 5 Basic Backup Facts Every Windows User Should Know We never tire to remind you to make backups and keep your data safe. If you're wondering what, how often, and where you should back up your files, we have straight forward answers. Read More . Special Features: 256-bit AES and SSL/TLS encryption, file version history, password-protected sharing links, remove device data wipe, collaborate with Dropbox Paper 11 Compelling Reasons to Try Dropbox Paper 11 Compelling Reasons to Try Dropbox Paper We have 11 compelling reasons for you to try Dropbox Paper. The new online document tool is off to a good start with features for personal use and collaborative work. Read More (what is Dropbox Paper? 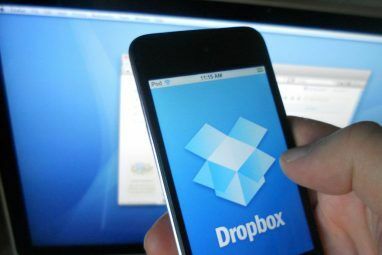 How Dropbox Paper Takes on Google Docs and Office Online How Dropbox Paper Takes on Google Docs and Office Online Dropbox Paper advances Dropbox from a file sharing and cloud storage service to a collaborative document editor. Can it compete with established competitors like Google Docs and Microsoft Office Online? Read More ), and integration with Microsoft Office 365. If you use Google’s Office Suite as your main tool for documents and spreadsheets, then you might as well commit to Google Drive. After all, files for Google Docs and Google Sheets are stored on Google Drive by default. Google Drive is also the easiest cloud storage to keep organized How to Organize Your Google Drive Like a Pro How to Organize Your Google Drive Like a Pro Google Drive's biggest benefits are its advanced search features. They can help you sort and organize your files and you'll always find what you need! 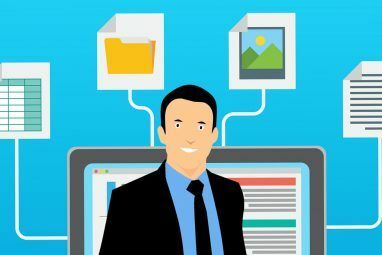 Read More , and you can extend it with plugins and tools Make Google Drive Absolutely Awesome with These Tools Make Google Drive Absolutely Awesome with These Tools Google Drive comes packed with smart features. And you can greatly expand its potential with third-party tools. Here we have compiled some of the best tools that plug into Google Drive. Read More that ramp up your productivity. When it comes to note-taking apps, OneNote is the best option currently available 7 Little-Known OneNote Features You Will Love 7 Little-Known OneNote Features You Will Love OneNote is 100% free and packed full of advanced features. Let's check out some of the ones you may have missed. If you're not yet using OneNote, these may win you over. Read More , especially if you don’t want to pay a single cent. It’s completely free and none of its features are locked behind any sort of paywall or subscription — and all of your notes are backed up on OneDrive. 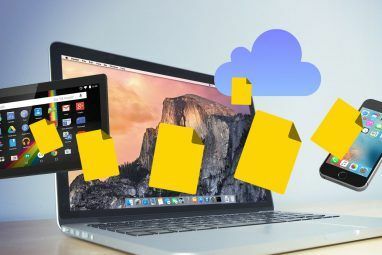 iCloud Drive is preferable for anyone who’s deeply embedded in Apple’s ecosystem What Is iCloud Drive and How Does It Work? What Is iCloud Drive and How Does It Work? Confused about what makes iCloud Drive different to Apple's other cloud services? Let us show you what it can do, and how you can make the most of it. Read More . It comes standard on any device running iOS 8 or later and OS X Yosemite (10.10) or later. Free users automatically start with 5 GB of storage, but you can upgrade to 50 GB, 200 GB, 1 TB, or 2 TB for $1, $3, $10, and $20 per month, respectively. Amazon Drive is one of the many benefits of an Amazon Prime subscription 10 Awesome Amazon Prime Benefits You May Have Overlooked 10 Awesome Amazon Prime Benefits You May Have Overlooked Free two-day shipping is just the beginning. Here are some notable Amazon Prime subscription benefits you may not know about. Read More . As a Prime user, you get unlimited storage for photos and 5 GB of storage for all other file types. You can upgrade to unlimited storage for $60 per year. No other service offers unlimited storage, so that’s noteworthy. If you don’t trust anyone but yourself, you can set up your own cloud storage using ownCloud, which is free and open source. It’s more technically-involved than a hosted solution though. Another option would be to set up a NAS device NAS vs the Cloud: Which Remote Storage Is Right for You? NAS vs the Cloud: Which Remote Storage Is Right for You? Network Attached Storage (NAS) straddles the line between a local hard drive and cloud storage, and gives you the benefits of both. Read More , which is like a cross between an external drive and cloud storage. Learn more on reasons to use a NAS device for data storage 7 Reasons to Use a NAS for Data Storage & Backups 7 Reasons to Use a NAS for Data Storage & Backups External hard drives are great for data storage, but there are many more benefits to using a network-attached drive instead. Here's everything you need to know. Read More . For example, you can use it as an online image gallery, or use it to store offline versions of maps Top 10 Creative Uses For Dropbox Or Other Cloud Storage Top 10 Creative Uses For Dropbox Or Other Cloud Storage The agility, flexibility, and low-cost scale ups turn cloud storage options into more than an online vault to back up your documents and files. But cloud storage is more than these important but mundane uses.... Read More , and it can even come in handy as a layer of defense against ransomware Protect Your Data From Ransomware With These 5 Steps Protect Your Data From Ransomware With These 5 Steps Ransomware is scary, and if it happens to you, it can make you feel helpless and defeated. That's why you need to take these preemptive steps so you don't get caught off guard. Read More . Again, you really can’t go wrong with any of the cloud storage services in this article. But, which one do you prefer? Are there any good ones that we missed? Let us know what you think in a comment below! 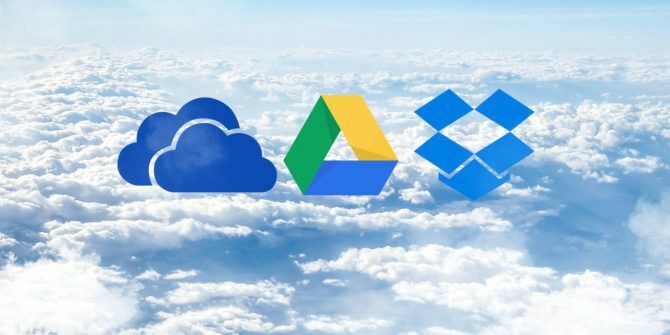 Explore more about: Dropbox, Google Drive, Microsoft OneDrive. How about MEGA? 50GB for free, decent upgrades. I just got totally screwed by Google Drive and will never use it again. I'm switching to Amazon Drive and Dropbox for redundancy. A couple of days ago I left my previous job and wanted to clear all my personal information from their laptop. I exported all my passwords and bookmarks and saved them on Google drive as CSV files. I then cleaned off my laptop, even removing Chrome so that nobody could access my information. I opened the files on Google Drive and checked a couple of passwords and bookmarks. Everything looked good. Today those files are gone, even my resume which has resided on GD for months. Six years worth of passwords and bookmarks, all gone. The idiot I got on chat on tech support insisted that there was no way to export passwords. Moron. He kept dodging my question about restoring from backup and insisted this was a Chrome problem, not GD. I will never recover all that information. I'm going back to Firefox and I'll manually back up all my information to two different cloud services. I never should have trusted Google with my information. I never will again. Lesson learned. Painfully. Your job manager was the one who edited your account. If your account doesn't end with @gmail.com, then what I said was right. They are spying on you because they were the ones who created your account. This is natural just to check what you are doing. If you use the regular Google account then that is better. No one will spy on your account anymore. It was 2004 (3 years before Dropbox) the term "cloud storage" didn't exist and I found two sites (I don't remember names) for online storage, backups and sharing of files. They were much better than Dropbox or Onedrive about uploading and organizing folders. I could upload the whole hard drive on it and they were for free. Then they closed the sites. I think they were ahead of time. In 2011 I heard some people saying that the genial Steve Jobs had invented the cloud storage with iCloud. Google Drive do NOT support Apple .key (keynote) format. The files are showed as folder. Dropbox do not have this problem. Sorry google, but if you pretend that your application is compatible with the most applications, you should improve it. For a world with quality not quantity ! I try to always use google drive, but it seems like onedrive operates in the background?? I just got a notice that my onedrive storage is almost full. How did that happen and what happens when it is actually full? How can I manage/limit its access to my stuff? You can right click the icon in your task bar to access settings and choose which folders to sync. You can also login online using any browser at outlook.com and manage your files there to. You can buy more storage there too. Can you cover google's C-suite as well? Anyone have thoughts about pCloud? I like iDrive. I can manually backup a particular file, or schedule automatic backups at my choice of intervals. I have it backup my systems while I'm sleeping so there is nothing else going on on my computers. I also have Dropbox, great for sharing with other researchers. But all of my system files are on iDrive. I avoid the popular clouds for privacy reasons. Surprised SugarSync is not on the list. True - it's not free, but it does have the distinction of allowing you to sync any folders you like on your system (or rather, on your systems). +1 for Mega. I also use Google Drive, Box and OneDrive. I was lucky to get permanent 15 GB of OneDrive during the initial promotions, so I use it as a main cloud backup with hard linking. Google Drive is for work files synchronization. Box and Mega for private file sharing. I stopped using Dropbox due to various reasons, but I still have an account, if someone else likes to use it with me. I got the same offer from Onedrive but the space will be reduced to 5 gb within few months ...they send me several emails notifying me about that....that's why i am considering google drive instead. * Files stored in Google App format take no space. You could run an entire business and take up virtually no space except for things like PDFS. * Google Photo offers unlimited storage space so long as you reduce to 13MP or so. This too does not go against your limit. So if space is an issue, and you can deal with your Word, Excel and PowerPoint files being moved to Google App version then Google has them beat. * Handy thing is that files don't need to be converted to be accessed online (unlike Google Drive) and it includes a text editor with syntax coloring (not too powerful, but handy working on some PHP files). * Sync-over-LAN makes managing files between 2 machines on the same network quicker and easier. You can update a file on your desktop and Dropbox will sync it online and then tell your laptop (if it is on) to get it from your desktop instead of having to go over the, usually slower, Internet. * If you want security, control and ability to make the disk space as large as you want (4TB? No problem) you could run your own ownCloud or Nextcloud server. Thank you, good point for each cloud. "Are there any good ones that we missed?" Yes, why not even a 'Notable Mention' for Mega, given the comparison criteria includes 'Free Storage: ', as others have highlighted, Mega offers 50GB for free? Are there issues wit the service you are aware of Joel that would be worth highlighting? Another vote for Mega. 50GB free for the asking - no gimmicks, no hoops to jump through. Good synching and versioning too. Mega touts its privacy and security. But with any public cloud, I encrypt sensitive files before uploading. In my experience, the goggle's sync client for Windows is surprisingly unreliable: it may hang, it is quite slow to load at start up and to sync, some files won't sync without an explanation. I'm really surprised google would even launch such a half-naked piece of software. I'd never had similar issues with Dropbox. I agree. The reason I switched to Onedrive is the unreliability of Google Drive syncing. I have found out the hard way that Dropbox offers support ONLY by email and in my experience it is terrible. I use Gdrive but Dropbox supports Linux that Gdrive doesn't do. Mega for big files. For office Android and web apps for google are very good. I have used Google Drive, Box.com, and OneDrive extensively. It sounds like Joel Lee has personal biases in terms of cloud storage, because I don't know why many people would bother using Dropbox if it only gives 2 GB storage (I'm talking about going the free route, which I do). As for the other services, OneDrive has become my favorite because of how I use it. I routinely edit Word and Powerpoint files from my home computer and work computer and they are saved directly on OneDrive. But I am also able to run Powerpoint presentations directly from the OneDrive web interface when I give lectures at work. The ease with which all of this can be done is tremendous because OneDrive integrates so nicely with Windows and Office products. Mega, like mega.nz, no? 5o GB free storage and a great client. Yeah... for me it's Mega.nz for big files since I get 50GB for free. and Google drive for smaller files.